An innovative iPad app to help cancer survivors, patients and their families, at every stage of the cancer. 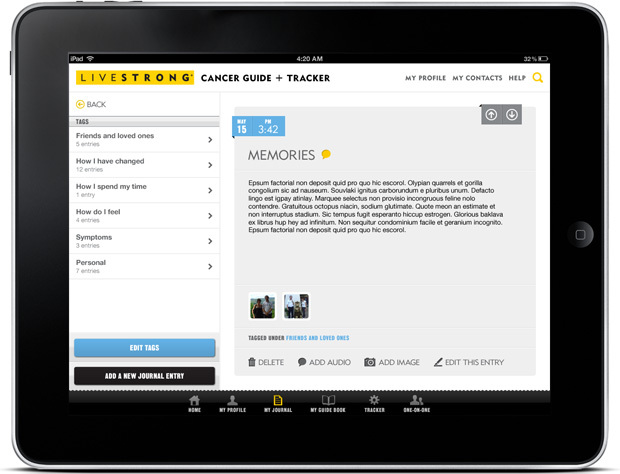 The app is a digital extension of LIVESTRONG's existing 'Guidebook and Planner & Journal' documents that offer useful advice, support and information. 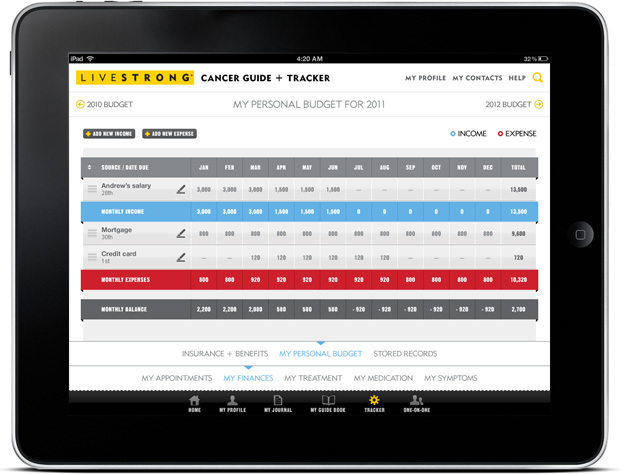 Predominantly, in it's new interactive capacity it acts as a 'tracker' allowing the user to track everything from their symptoms, to their treatment plans, medication, appointments, keep track of important financial information, budgets, contacts and record a journal. It's a truly great and innovative app. And an honour to be involved with. 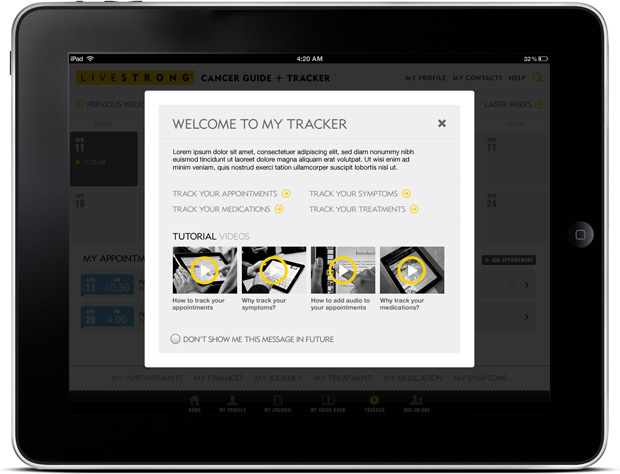 "The cancer guide and tracker app is a revolutionary step towards improving the quality of patient care." To use the app, the user must first create an account. This simple welcome screen explains that, introduces the app, links to an introductory video (see next screen) and allows existing users to sign in. 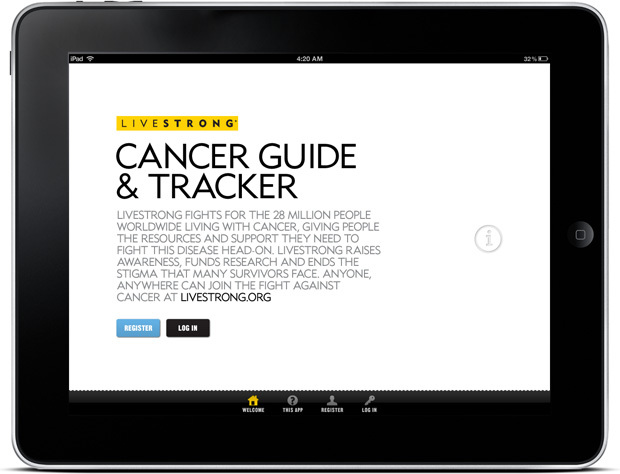 A video introducing the app and it's features is accessed via the home screen, prior to you creating an account to use the app. 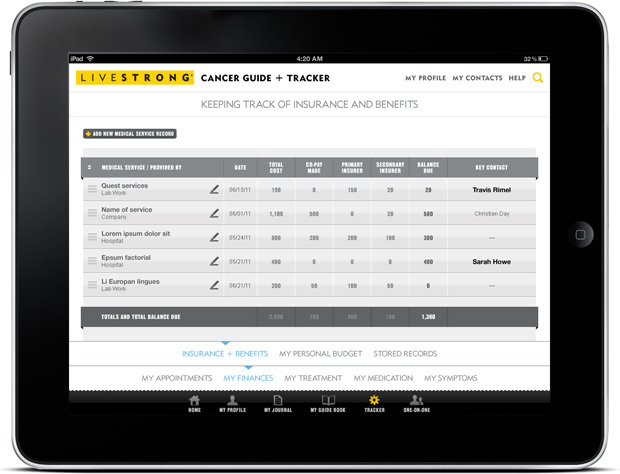 The main dashboard streams all data the user inputs into one simple interface. 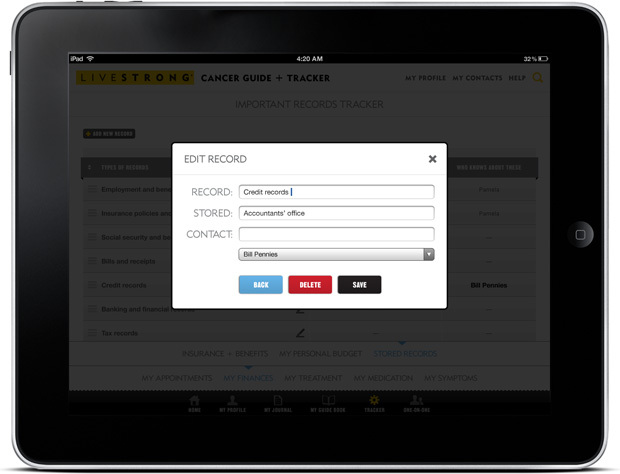 You can quickly add/edit/delete data from this screen, or visit the dedicated features/sections for a more in-depth experience. When the user first signs up for the app, the dashboard looks a little like this, obviously with no data. Over time the dashboard fills up with data the user(s) has added. 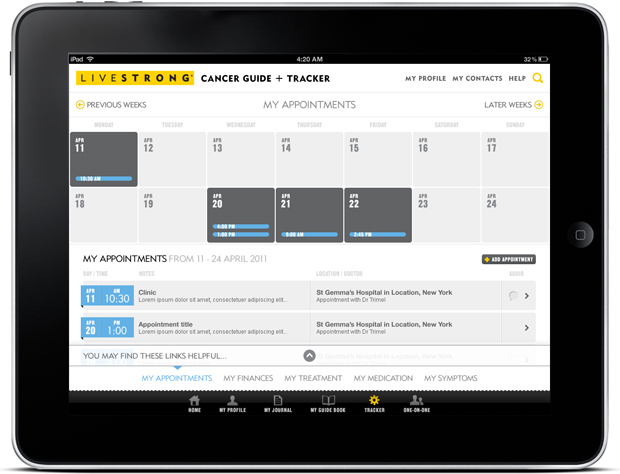 A useful and simple feature to track how the patient feels every day (and throughout each day), which can be presented to the doctor in future appointments. 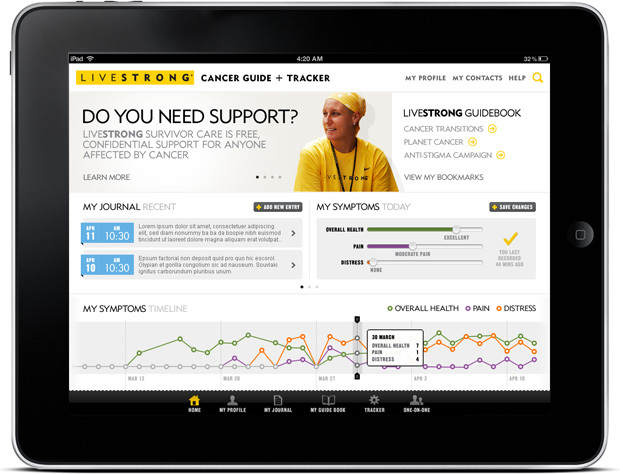 Three slide bars allow the user to tap and slide the bar left-to-right to indicate how they are feeling (overall health, pain and distress). 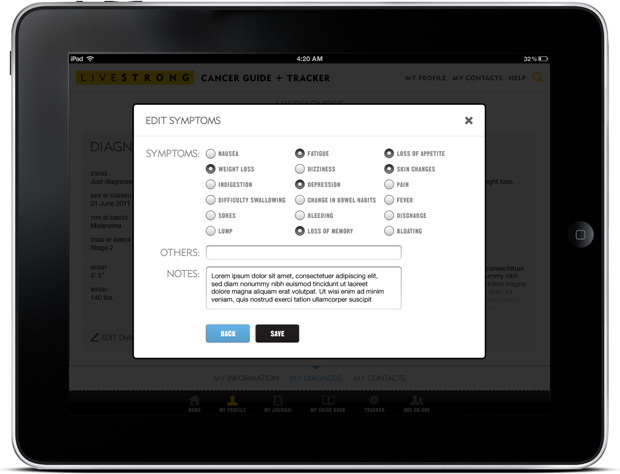 Every entry is recorded on the timeline at the bottom of the screen, which you can swipe left-to-right to see a history of symptoms. 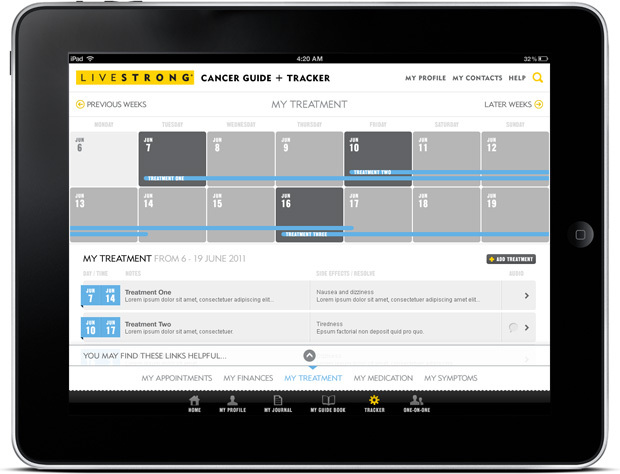 This can be useful for relating to any treatments, symptoms or events, in an attempt to track negative/positive reactions to treatments, or change in condition. A diary, should the user want to keep a journal of their treatment, feelings, wishes...... 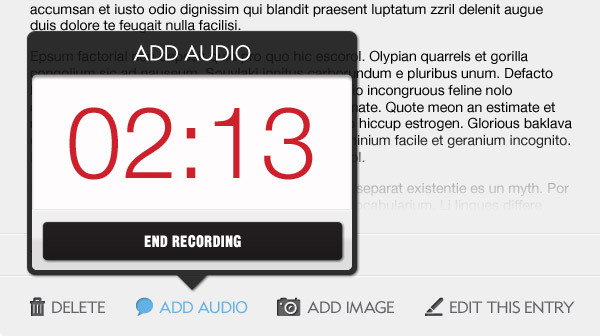 They can add video and/or audio clips instead or in addition to written entries, should they not feel up to writing. 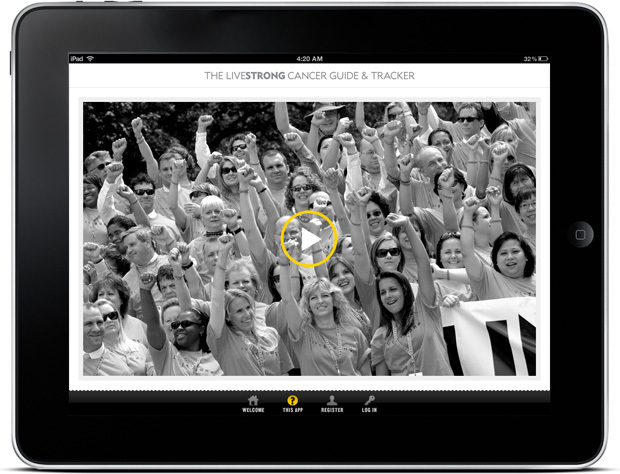 You can also attach/upload images/photos to entries. All entries can be tagged and organised. The timer makes it clear and obvious that the app is recording. 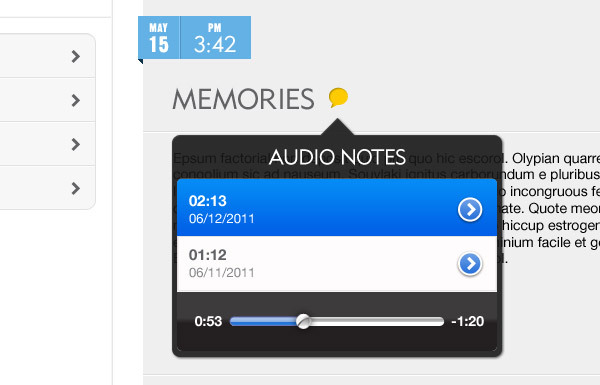 View and listen to existing audio clips per journal entry. To save 'screen estate', for any data input, on-tap of the call-to-action a modal style window overlays everything else, focusing on the data entry. The data inputs are simple, brief and clear. 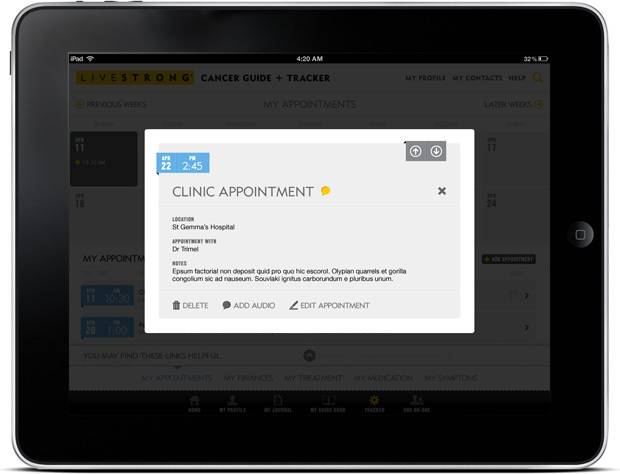 Keeping track of doctor, hospital, clinic etc... appointments. Tapping a day/date lists all appointments entered for that day below. Tapping an entry shows its details (see next screen). 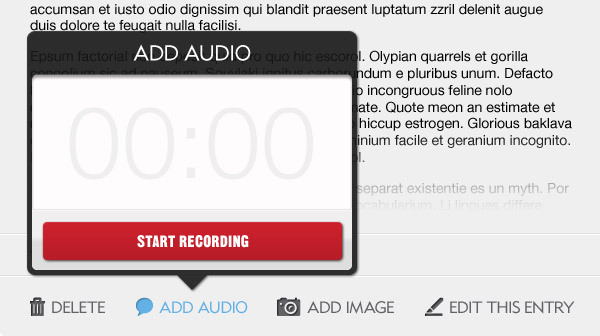 Another modal style overlay to save space and focus on the key content. Similar to My Appointments, but this time more like iCal, to span days/weeks. 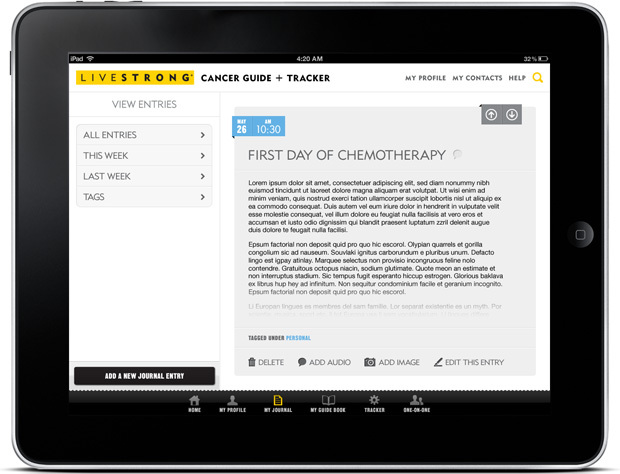 Making it simple to keep a track of your treatments. There are many different forms of treatments (to attend) and dozens of pills to take, this helps to remember what to take, and when. Videos tutorials to help the user use the different app functions. I wish I had one of these for calculating my finances! 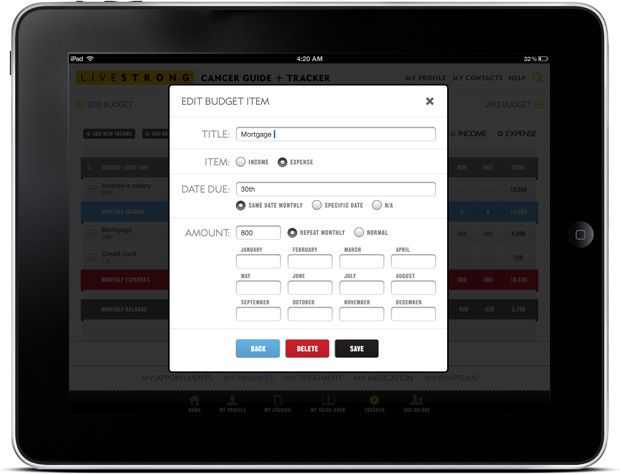 ;) Simple data inputs allow the user to add financial information (income and expenses), and on-submit, it calculates everything for you, to help you plan/manage your budget. 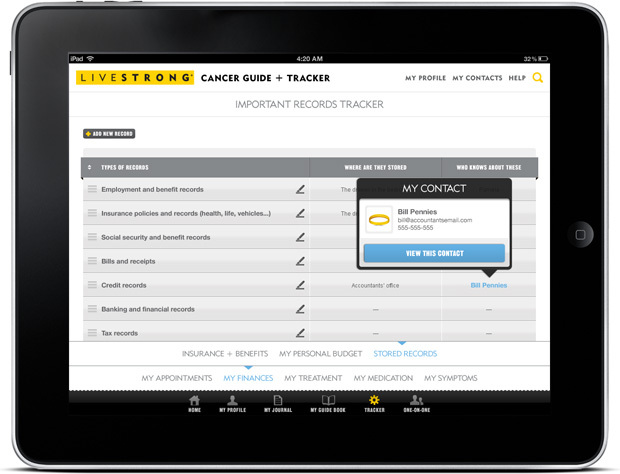 You enter individual items (income or expense) one at a time. The 'radio buttons' and data inputs cover all possible financial scenarios, so it's really simple to use, taking the hard work (and maths) out of creating a budget. 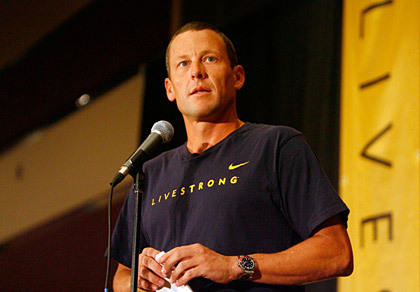 For users that want a more personal approach, comfort, advice... 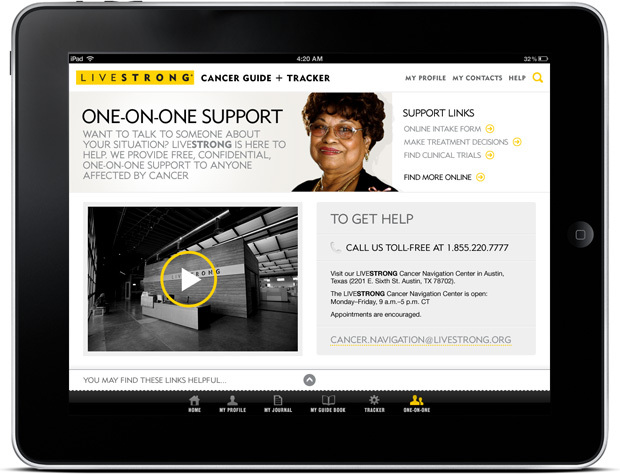 There is a section called "One-on-One Support" with contact information and a video introducing the LIVESTRONG HQ in Austin, Texas where they can visit.